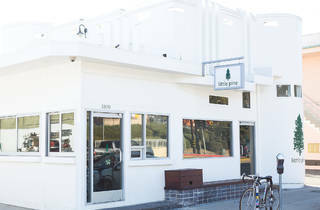 The ethos behind Little Pine, a vegan restaurant in Silver Lake, is commendable, but the food still needs some work. 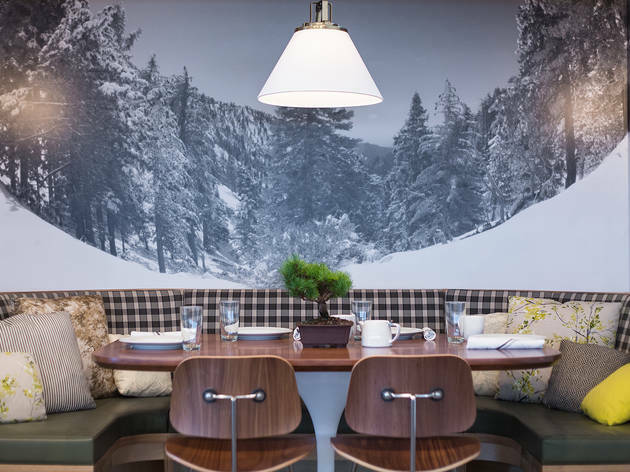 There is plenty you want to like about Little Pine. 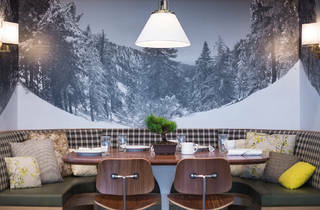 The Silver Lake restaurant—opened by Moby, as I’m sure you’ve heard by now—is 100 percent vegan. 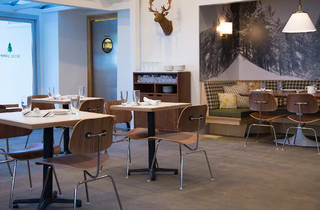 Inside, the earthy design channels a cabin-in-the-woods vibe, an aesthetic that casts a peaceful calm over the space. And how could anyone dislike a restaurant so charitable, one that gives all of its proceeds to animal welfare organizations? 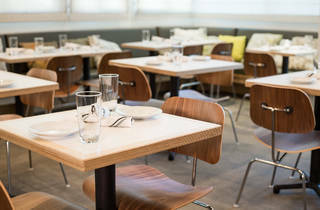 I wanted to like Little Pine for all of these reasons and more, but the food wouldn’t let me. That’s not to say that good food is entirely lacking here. 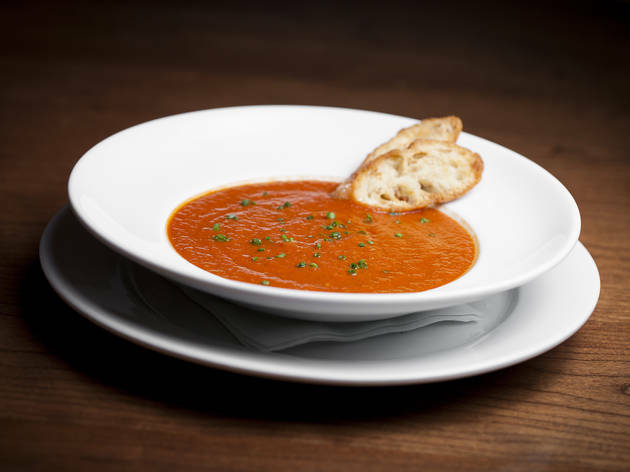 The tomato soup here is a solid antidote to a chilly LA night, and the broccoli arancini, while not the healthiest, fills every creamy-meets-fried craving you might have. And the mac and cheese? Toss aside any misgivings you might have about vegan versions of this dish. 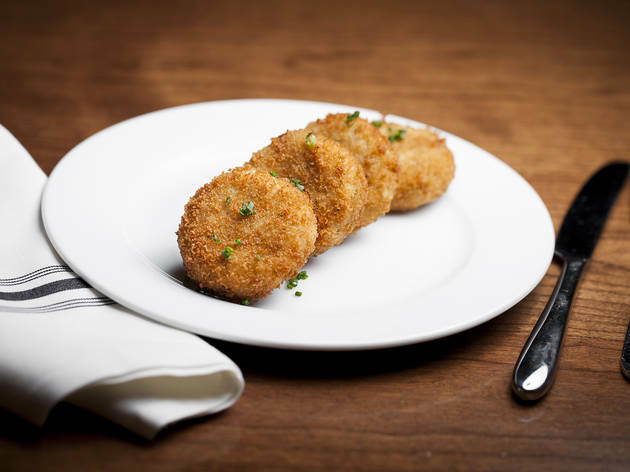 Made with gluten-free pasta and housemade cheese sauce, and topped with toasted breadcrumbs, it’s a clear standout among the other menu items—thanks, in part, to a nice textural contrast between the crust and the al dente noodles. What a shame, then, that it comes as such a small portion. “I could easily eat two of these,” said my friend, while I secretly wondered if even two would be enough. 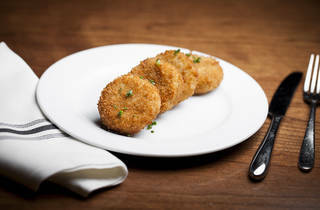 Arancini, mac and cheese—these are not the best dishes to judge a vegan spot’s merits. What of the more vegetable-based items? Sadly, this is where Little Pine begins to fall apart. A farro walnut salad is laden with oil, coating everything from the butternut squash to the pomegranates. The wild mushroom bruschetta managed to be an exercise in oil, too, as thick wild mushrooms and caramelized onions seeped into the bread. 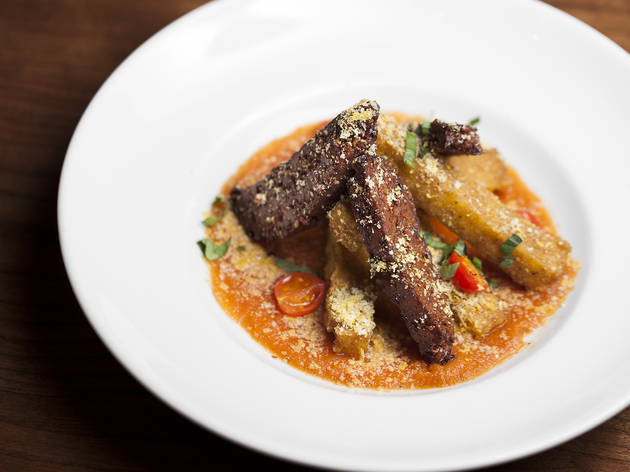 When a meat substitute, seitan, was paired with polenta, I expected a creamy bed of the cornmeal, not the fried, greasy sticks of polenta that arrived. How is it that I felt more unhealthy eating here than at a taco truck down the street? 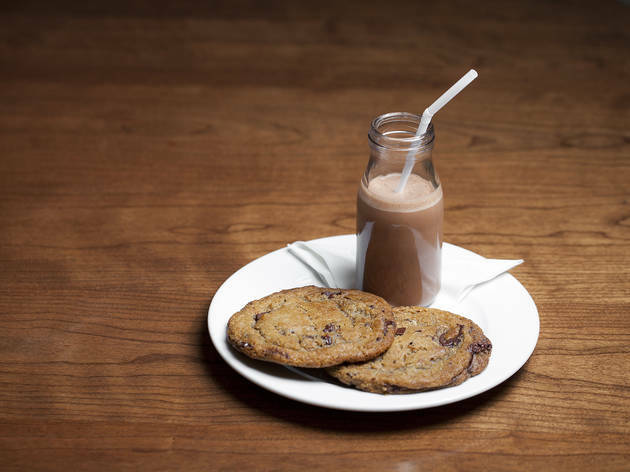 You can end your meal with a decadent duo of cashew milk and gooey chocolate chip cookies, though it will not leave you feeling any better about yourself. 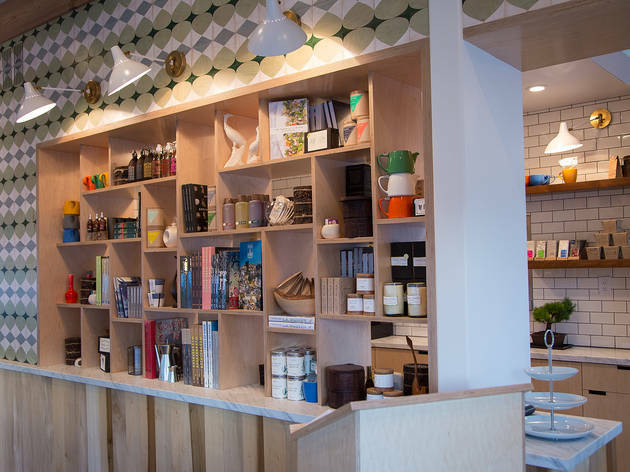 I wish the vegetables at Little Pine had been more utilized and on display, highlighted in a way to show that, yes, you can create incredible dishes without meat or other animal products. 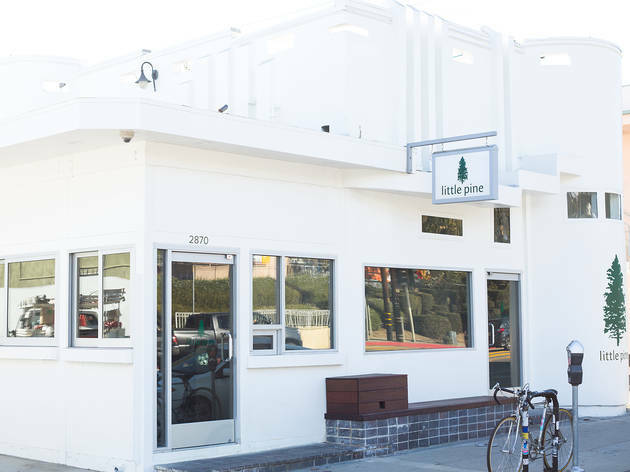 There are enough vegan restaurants in LA that already do that, and maybe that’s part of the problem: in a city where veganism is less of an anomaly and more of the norm, Little Pine doesn't have the chops to stand next to its meat-free brethren. 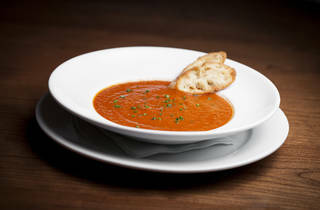 What to Eat: The tomato soup ($6/8). The broccoli arancini ($9). 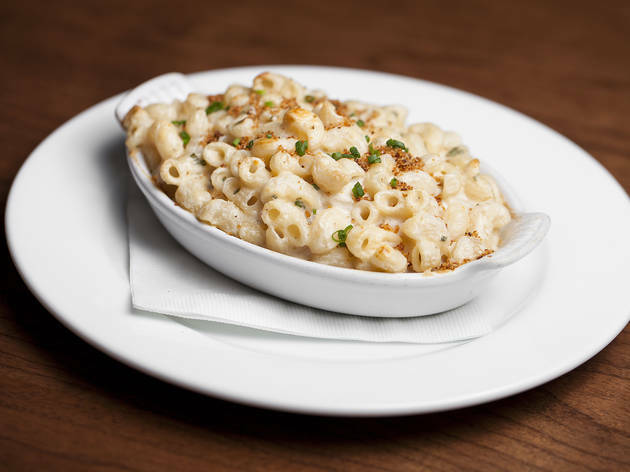 The macaroni and cheese ($12). 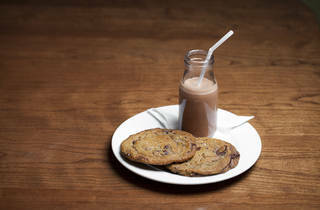 The chocolate chip cookies and milk ($10). 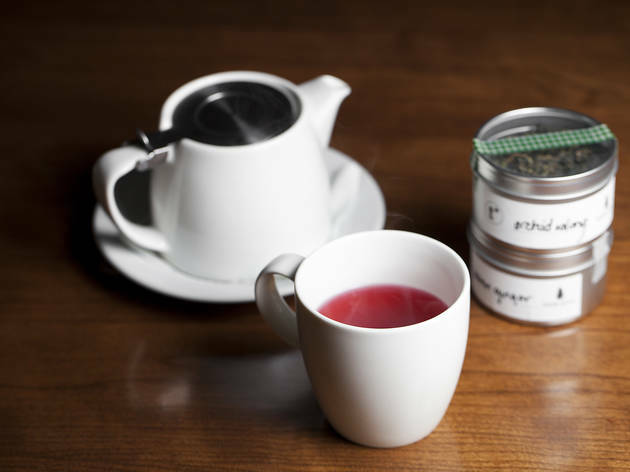 What to Drink: Little Pine has a great wine list—a smooth Nero d'Avola from Broc Cellars was almost the best part of our meal—but just as impressive is the tea list, an obvious point of pride for Moby. Tea can be ordered by the cup or pot and comes in a rainbow of options: green, black, herbal, oolong, you name it. Chocolate, strawberry and vanilla cashew milk is also available—a viable dessert option on its own. Where to Sit: A select number of seats are available on the outdoor patio, but there’s plenty to look at inside, too: candles, rustic wallpaper, a charming gift shop. One deterrent? Some of the chairs are stiff and uncomfortable. 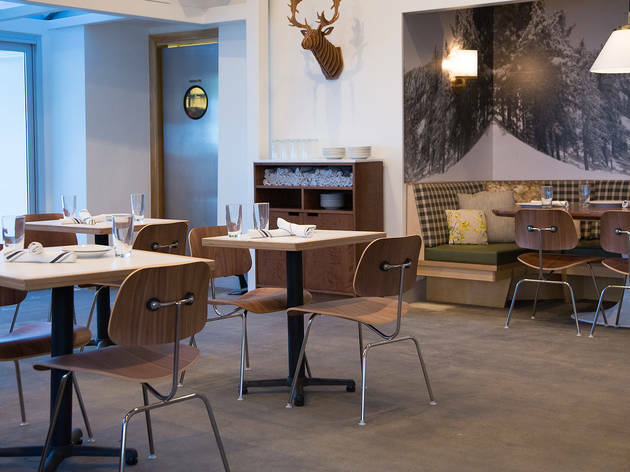 Starpower, vegan cuisine, and clean design make Little Pine a great spot to visit. 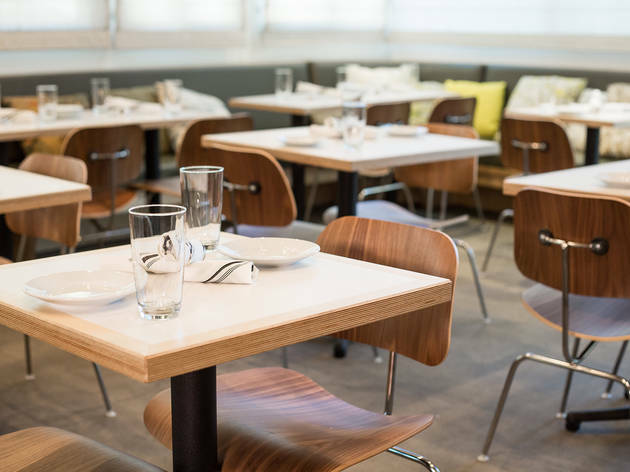 With Moby behind it, Little Pine donates proceeds to animal rescue services, as well as provides discounts to those who work with animals. The food can be hit or miss, with some dishes being delicious, and other ones seeming not worth having on the menu (the fake bacon at brunch in particular was not great tasting). 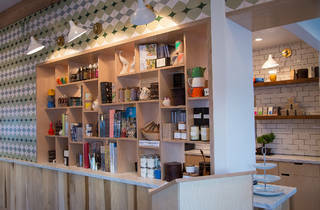 The restaurant's interior and exterior are sure to delight, and they also have a selection of curated items for purchase. Parking can be tricky during the day, but surrounding streets usually have something. 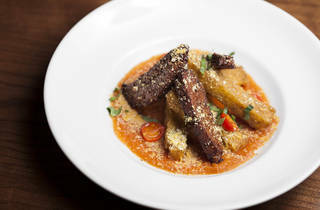 Little Pine takes the stereotype of vegan food being tasteless and uninspiring and throws it out the window! I'm so happy they were at the Mac & Cheese Smackdown so I could discover how good it was. The only place in L.A. that I have found with gluten free mac and cheese! It is absolutely delicious and the chef here makes great care to ensure that it's truly gluten free. LOVE this place! I've only had the mac & cheese here, which was by far the best vegan, GF mac I've ever tasted. I've heard the rest of the menu can be a bit hit or miss, but if the mac & cheese is any indication, they're doing something very right! It's great to see more options like this popping up on the East side. Thanks Moby! I'm obsessed with Little Pine! The decor is absolutely beautiful and so is all of the vegan options. 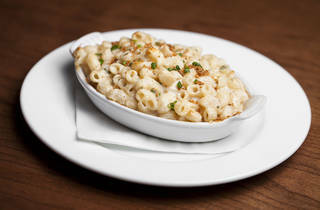 The mac and cheese that they offer is one of the best vegan mac and cheese dishes I have had! Best vegan food I've ever had in immersive, sanctuary-like surroundings. I literally feel refreshed and revitalized like I just came back from a vacation when I leave. If it weren't vegan, I wouldn't notice. The sharing element of having small plates is super fun (PERFECT for dates), and the way ingredients come together is so innovative, and a natural topic of conversation. I really want to love this place. It has all the makings of a dream neighborhood restaurant. Fancy enough for a date, casual enough for any day, tables big enough for a small group to gather when you want to hang with friends, but never too loud or clattering. You might even see Moby himself bustling around. However, over two visits, the menu felt a little off. They seem to be attempting 'comfort food' feelings with the mains - and there's nothing wrong with vegans getting some comfort food if they want it - but it ends up coming off a little heavy. Is it odd to feel like the vegan spot should have more vegetables? Still, a great ambiance and totally worth a repeat visit.